The roar of blazing muskets echoes off the white walled garrison. Puffs of pungent smoke from black gun powder drift across the parade ground. And visitors unclasp their hands from their ears as the deafening noise fades away. 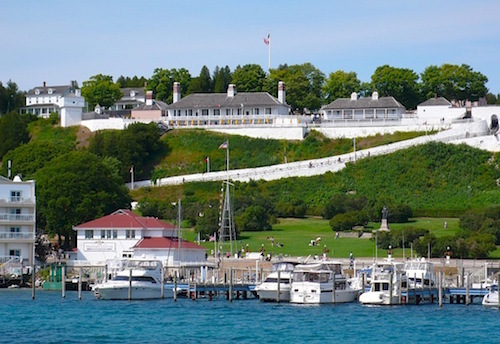 At Fort Mackinac, visitors get a chance to see soldier life as it was more than a century ago. 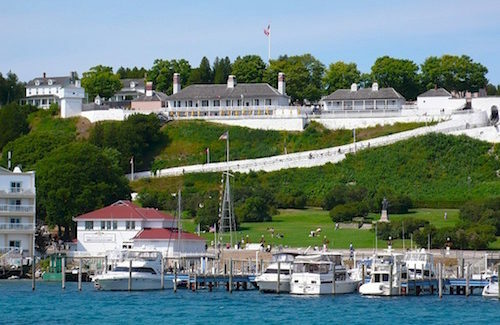 Perched high on a bluff overlooking the city of Mackinac Island and its harbor below, the fort served as an important Great Lakes military outpost until it was given to the people of Michigan by the federal government in 1895. Today the restored fort is a national historic landmark and part of the Mackinac State Historic Parks. The scene of the white stockade looming above the island’s downtown area is probably one of the most photographed in the state. From below, the fort looks formidable with its ramp winding up the hillside. But the climb up the 150-foot cliff is worth every step. For those who don’t want to walk, a carriage tour drops visitors off by the fort’s hilltop entrance. Atop the cliff, the island and the waters of Lakes Huron and Michigan spread out in a panoramic view. Truly a formidable bastion, the island would be almost impenetrable to enemy attack from the east, west or south. Unfortunately for the Americans, the enemy came from the north. Fort Mackinac changed hands twice during its early history. British commander Patrick Sinclair reluctantly moved to nearby St. Joseph’s Island when the treaty ending the American Revolution awarded Mackinac Island to the young United States. In 1812 at the very outbreak of the second war with England, the Redcoats and their Indian allies returned and secretly landed on the far northern shore. Invaders crept through the woods and surprised the sleeping American garrison on July 17. The outnumbered and outmaneuvered U.S. Lt. Porter Hanks chose to surrender. Two years later, an American force attempted unsuccessfully to retake the island. What they could not win in battle was given again by treaty. The fort became American in 1815 and the Army stayed until 1894. Visitors can now experience military life during the 1880s through costumed reenactments, period craft demonstrations and artifacts housed in 14 original buildings. But the fort is more than a look-and-don’t-touch museum. Visitors can help prepare a cannon for firing, try their hand at drumming, take part in a court martial or play children’s games. Soldiers were encouraged to lead clean lives and in 1855 a bathhouse complete with six tubs and hot and cold running water was built to provide baths once a week.